This bold pair of fashion sunglasses is perfect for the celebrity look. The shiny black frames and shield lens demand attention, while the silver flash detail along the arms provide a touch of glamour, taking your look from day into night. Will they suit me? 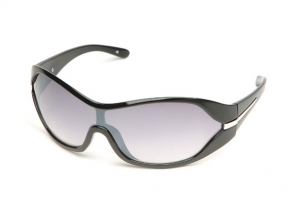 These sunglasses have a wrap effect that work well with an oval or an oblong face shape. Compliant with EU and US safety standards.